Please review our Terms of Service to understand & acknowledge the purpose of our website, how we provide services & explanations of other important information related to our website & services. Website Purpose and Company Services. The content on the Website is for informational, educational and illustrative purposes only and may not be intended for consumers in every state. In addition, please review our licensing page for further details or contact us with any questions as Welcome Funds Inc services may not be available in all states. Policy Appraisal/Website Qualification Form. Welcome Funds Inc's Policy Appraisal/Website Qualification Analysis Form ("Qualification Analysis") and any and all corresponding conclusions shall be used for informational, illustrative and educational purposes only. No representation or warranty, expressed or implied, is made as to the accuracy, reliability or completeness of the results of the Qualification Analysis or any assumption on which any conclusion is based. The Qualification Analysis is an initial, simplified, automated proprietary analysis that is based upon the experience and industry knowledge of Welcome Funds Inc - it is not a contract, prediction of offers, offer to purchase a policy, or a solicitation to buy or to sell a security. Accurate age, health and policy information is required to yield the most beneficial results and it is recommended to contact Welcome Funds Inc to discuss and determine the applicability, if any, of such results. The Qualification Analysis is not intended to replace the submission of a policy to the market and actual contingent offers received may be more or less favorable than those indicated. Welcome Funds Inc is not liable for any action or inaction taken by any party who is relying on the results of the Qualification Analysis to determine his/its decisions. All parties accessing the Website and who receive results from the Qualification Analysis assume full responsibility of its use; any loss or damage suffered as a result of reliance, in any capacity, on such results is the full responsibility of the parties accessing the Qualification Analysis. Welcome Funds Inc has no responsibility to update the Qualification Analysis for events and circumstances that occur subsequent to the date the Qualification Analysis is generated. No Representation, Liability or Advice; Other Considerations. Welcome Funds Inc issues no representation or warranty about the suitability or completeness of the information contained on the Website and any corresponding conclusion or calculation derived thereof - all information, including the results of the Qualification Analysis, is provided "as is" and may contain technical inaccuracies and/or typographical errors. You assume full responsibility for any loss or damage, including without limitation special, indirect or consequential, suffered as a result of reliance on any such information and Welcome Funds Inc is not liable for any action or inaction taken by you to determine your decisions. Welcome Funds Inc disclaims all warranties and conditions of any kind regarding such information, including all implied warranties and conditions of merchantability and fitness for a particular purpose - nothing on this Website creates an express or implied contract. No case study, analysis, valuation or recommendation related to any life insurance policy can replace the actual submission of such policy to the market. Welcome Funds Inc issues no representation or warranty as to whether a particular policy will generate any contingent settlement offers or ultimately be sold. In addition, Welcome Funds Inc does not purchase policies, is under no obligation to ultimately find a buyer of the policy owner's policy and is not responsible for any breach committed by a buyer if one is identified. Furthermore, Welcome Funds Inc does not provide any advice regarding whether or not to proceed with the life or viatical settlement transaction - the policy owner shall reach his/its own decision and is free to accept or decline any contingent offer. Once the viatical or life settlement transaction is completed and the applicable rescission period has ended, the policy owner, insured and any beneficiaries previously designated by the policy owner have no right to the death benefit of the applicable life insurance policy or policies that have been sold, unless stated otherwise in the viatical or life settlement contract. Welcome Funds Inc is not providing any financial, legal, tax, investment, securities or accounting advice whatsoever and such advice should be obtained from the appropriate parties to determine, in part, any impact to estate plans, tax returns, government benefits and entitlements, availability and cost of other or replacement insurance and whether selling the existing life insurance policy is more beneficial than other potentially available options. Additional Limitations. The policy owner, and not Welcome Funds Inc, is fully responsible for the timely payment of any and all premiums due for the policy that is the subject of the viatical or life settlement transaction, on the applicable due dates, up until change of ownership of the policy occurs. The policy owner, not Welcome Funds Inc, assumes sole responsibility if the policy lapses for such lack of timely payment of any and all premiums. In addition, Welcome Funds Inc is not a life expectancy provider or firm that produces life expectancy reports; does not determine life expectancies; is not a medical or mortality expert; does not provide mortality or medical reviews; does not evaluate the health of the insured; is not responsible for the conclusions of life expectancy providers and/or firms that produce life expectancy reports; and does not have the expertise to dispute the conclusions of life expectancy providers and/or firms that produce life expectancy reports. The insured may live longer or shorter than any life expectancy projection or estimate. Real Stories. Real stories are based on the internal files of actual viatical and/or life settlement transactions conducted by Welcome Funds Inc since 2003. All transaction data, dollar amounts and health conditions are accurate to the best of our knowledge. The specific characteristics of each case, including but not limited to the names and images of our clients, have been changed to protect their privacy. Real stories are not a contract, prediction of offers, offer to purchase a policy or a solicitation to buy or sell a security. Please be advised that past performance is not indicative of future results as each case is different. Actual viatical/life settlement market bidding results may be more or less favorable than those indicated and the nothing is intended to replace the actual submission of a policy to the market. Market conditions and offers vary and you are advised to seek the services of an experienced life settlement broker like Welcome Funds Inc to ensure that fair market values are obtained. Available Documents. Permission to use documents, including but not limited to press releases, FAQs and reports/commentaries from the Website is granted, provided, that (1) the copyright notice below appears in and/or all copies; (2) use of such documents is for personal and non-commercial use only and shall not be copied, posted or made accessible on any network computer or transmitted via in any electronic or written medium; and (3) no modifications of any documents are made. Use for any other purpose is expressly prohibited by law, and may result in severe civil and criminal penalties. Violators will be prosecuted to the maximum extent possible. Documents specified above do not include the design or layout of the Website or any other owned, operated, licensed or controlled site by Welcome Funds Inc. Elements of the Website are protected by trade dress, trademark, unfair competition, and other laws and may not be copied or imitated in whole or in part. No logo, graphic, sound or image from the Website or any Welcome Funds Inc website may be copied or retransmitted unless expressly permitted by Welcome Funds Inc. Copyright Notice. Copyright © 2000-2013 Welcome Funds, Inc, 6001 Broken Sound Parkway, Boca Raton, FL 33487, U.S.A. All rights reserved. Service Marks. 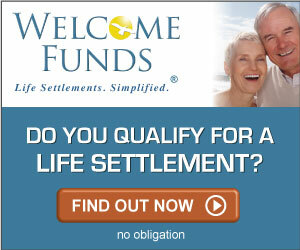 Welcome Life®, Life Settlements. Simplified® and PolicyTrac® are registered service marks of Welcome Life Financial Group, LLC. Trademarks. The names of third party organizations, firms, companies and their corresponding products and services mentioned and/or referenced herein may be the trademarks of their respective owners. Rights Reserved. Any rights not expressly granted herein are reserved by Welcome Funds Inc. In addition, Welcome Funds Inc reserves the right to change the terms of service at any time and from time to time by revising these terms and conditions. You are responsible for regularly reviewing these terms of service.